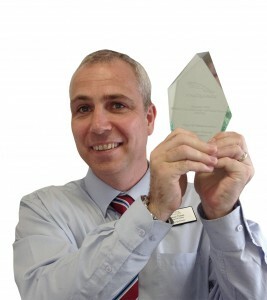 Simon Thomas, Service Advisor Grange Jaguar Swindon, won through to the finals of Jaguar’s service advisor of the year. In order to qualify Simon had to have an in depth technical knowledge of Jaguar’s systems, service procedures and complete specific e-learning modules throughout the year. This he did with skill and confidence. Simon’s knowledge was combined with the dealership’s Guest feedback through Jaguar’s Guest questionnaires to achieve an overall score. After a final round of questions at Oulton Hall in July, Simon achieved 2nd place in the UK final and was presented with a trophy from Richard Keates, Jaguar Land Rover Aftersales Manager. Simon and Tom Nuttall, Brand Manager at Swindon, then enjoyed a meal with after dinner speaker Rob Beckett, comedian, giving them with their wives an evening of entertainment. Simon is on track again this year to be in the final and hopefully will attain the number one position. Simon is a valued member of Grange Swindon and respected by our Guests.